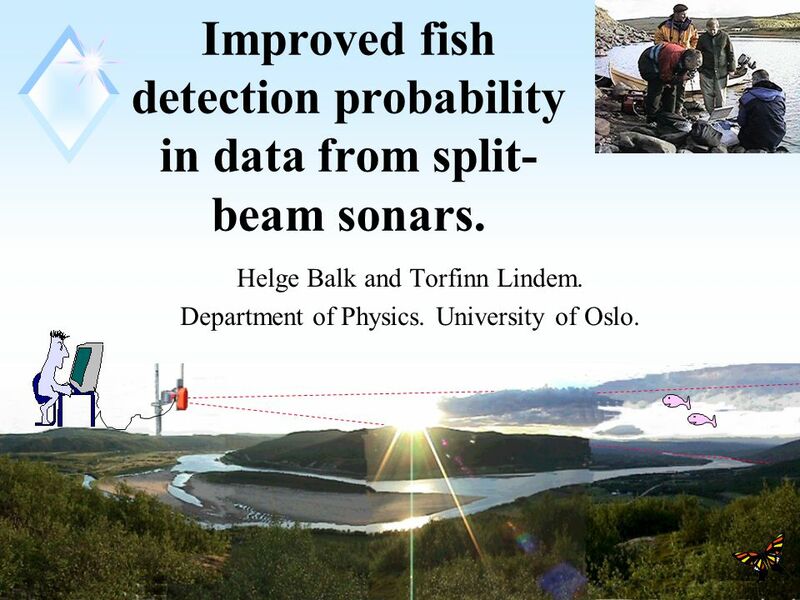 1 Improved fish detection probability in data from split- beam sonars. Helge Balk and Torfinn Lindem. Department of Physics. University of Oslo. 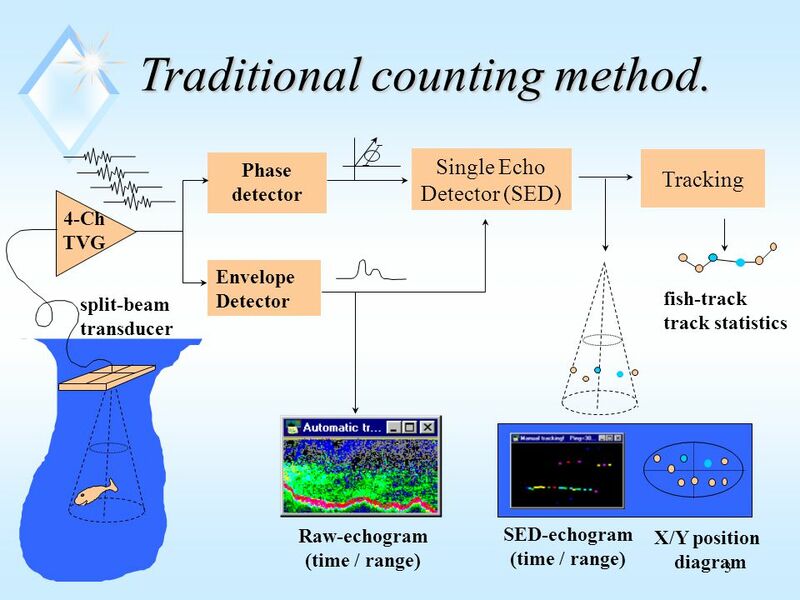 1 1 Improved fish detection probability in data from split- beam sonars. Helge Balk and Torfinn Lindem. Department of Physics. University of Oslo. 7 7 How to improve the method. Four salmons on a rainy day in Tana. 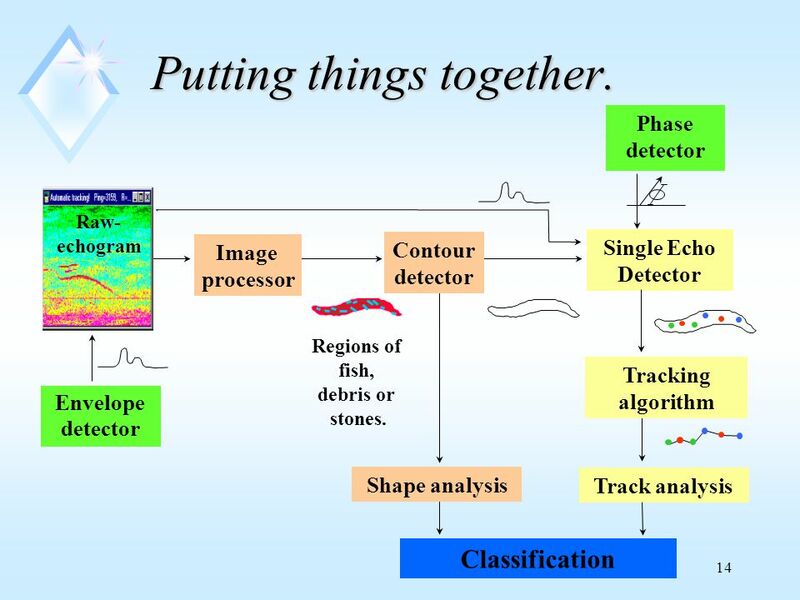 Raw-echogram SED-echogram Classification Tracking SED Collect more data. Extract more information from existing data. 12 12 Segmentation. u Edgebased. 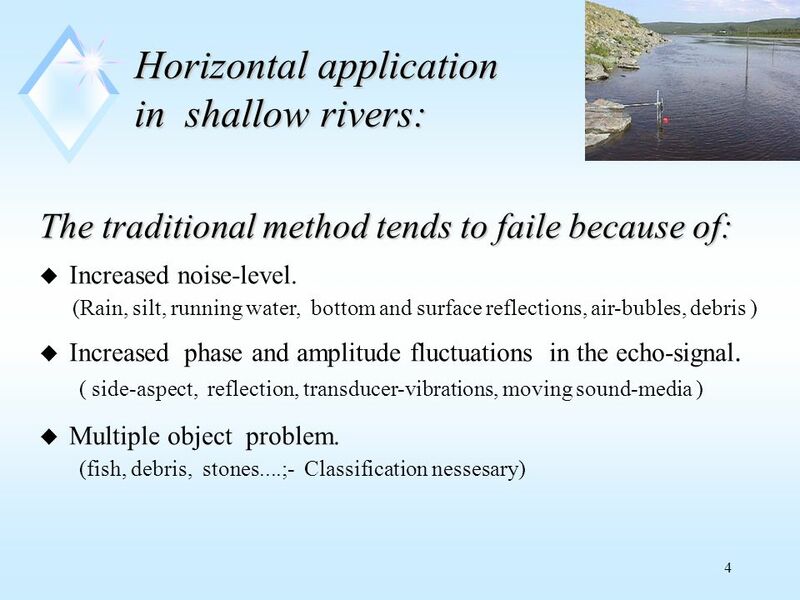 u Detecting edges. (high-pass: gradient, Laplace.) u Linking. u Region based. u Tresholding. u Growing and shrinking. u Seeds. u Split and merge. u Relaxation. Separating background and foreground. 13 13 Shape analysis. u Central moments. u Radius of gyration. u Orientation. u Topological features. u Area. u Contour length and smoothness. u Compactness. u Eccentricity. 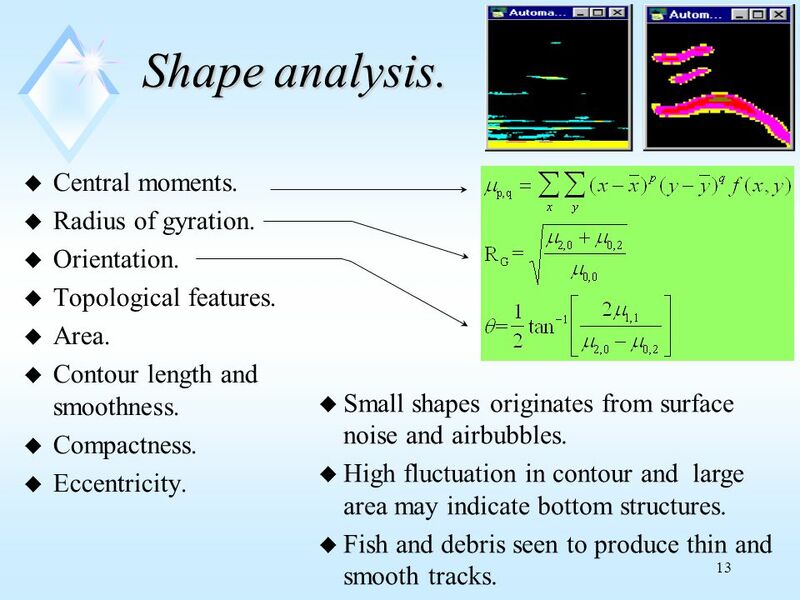 u Small shapes originates from surface noise and airbubbles. u High fluctuation in contour and large area may indicate bottom structures. 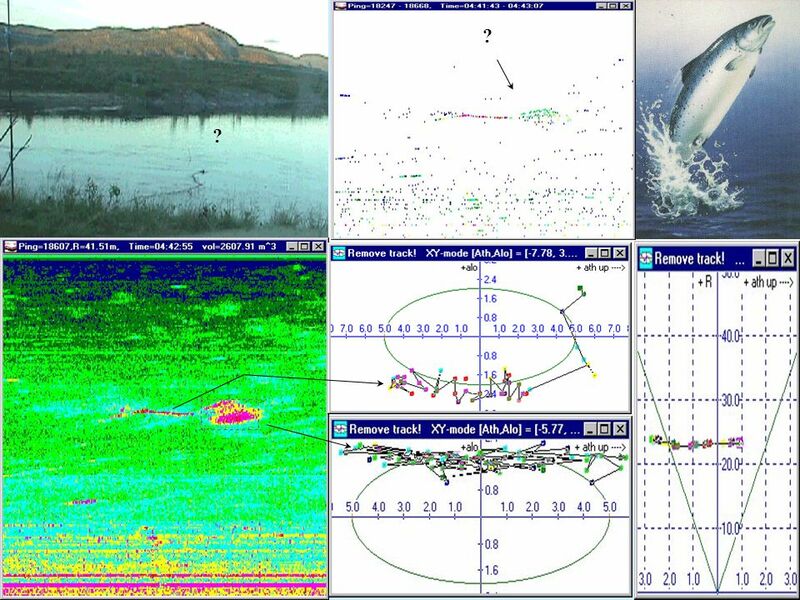 u Fish and debris seen to produce thin and smooth tracks. 16 16 Conclusion: Conclusion: Combining image analysis with the traditional metod is promising! 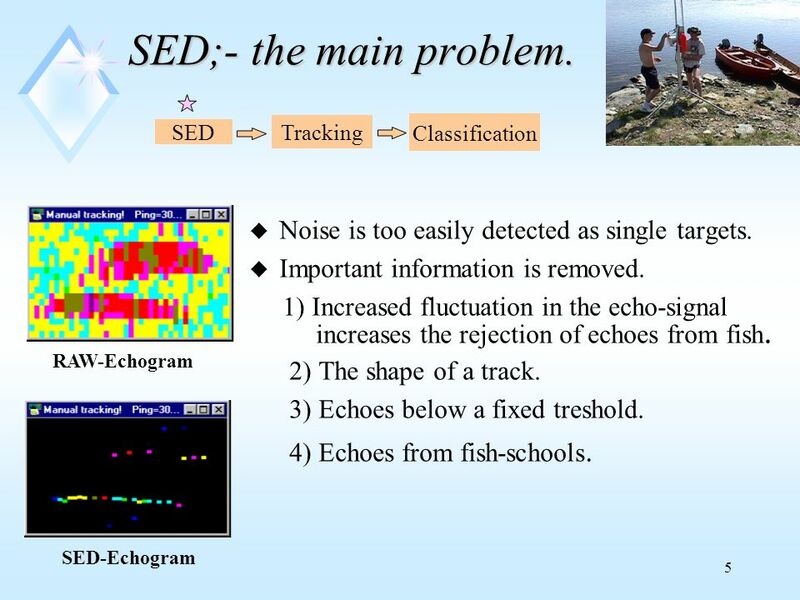 u The traditional SED is still reducing the fish detection probability. 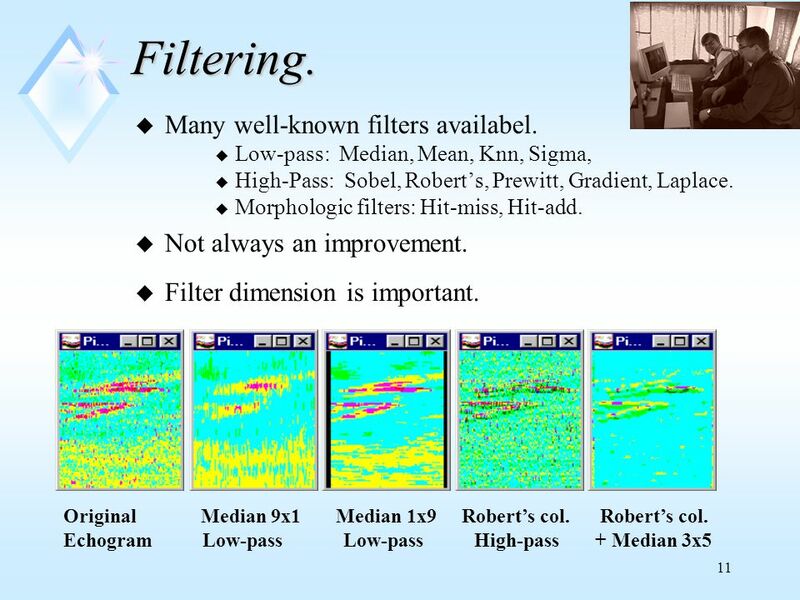 u Difficult to find one parameter setting that manage to handle all kinds of tracks and noise. More research is needed! 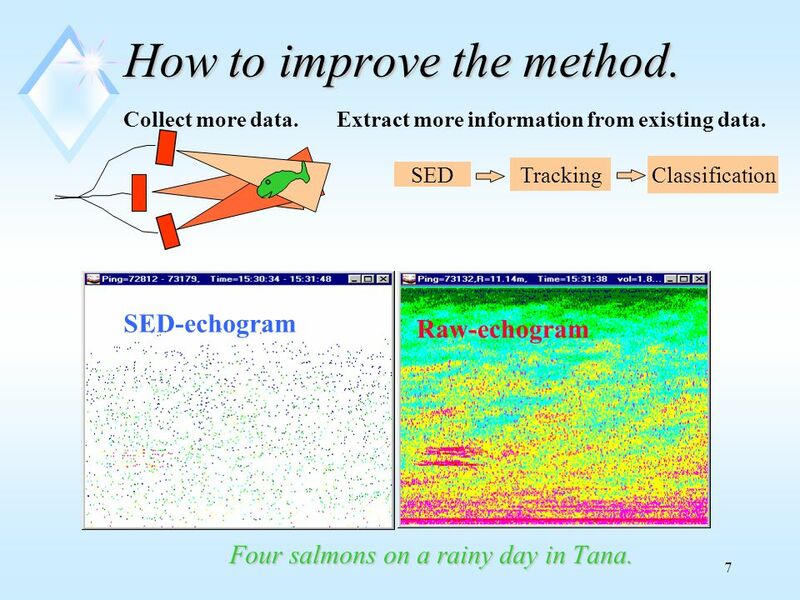 u However we have shown that this method manages to: * Extract and use important information lost by the SED. 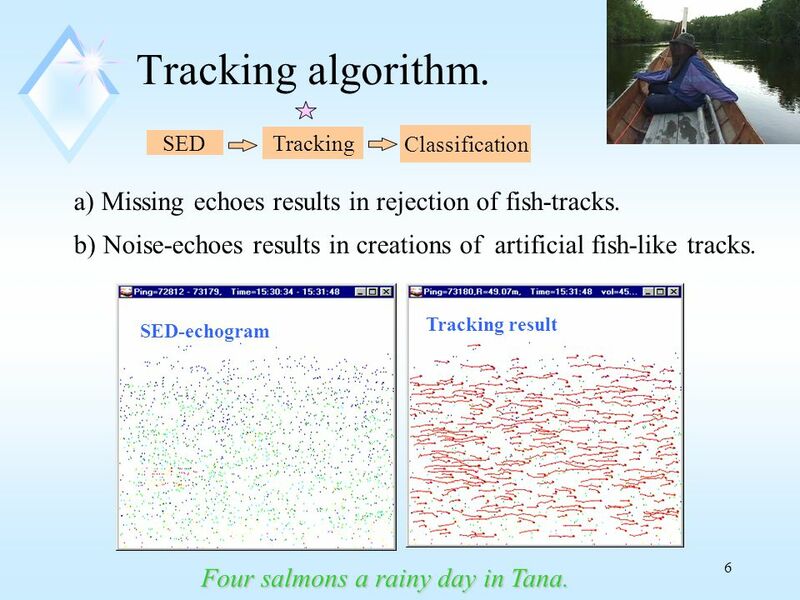 * Reduce the creation of noise-based fish tracks. 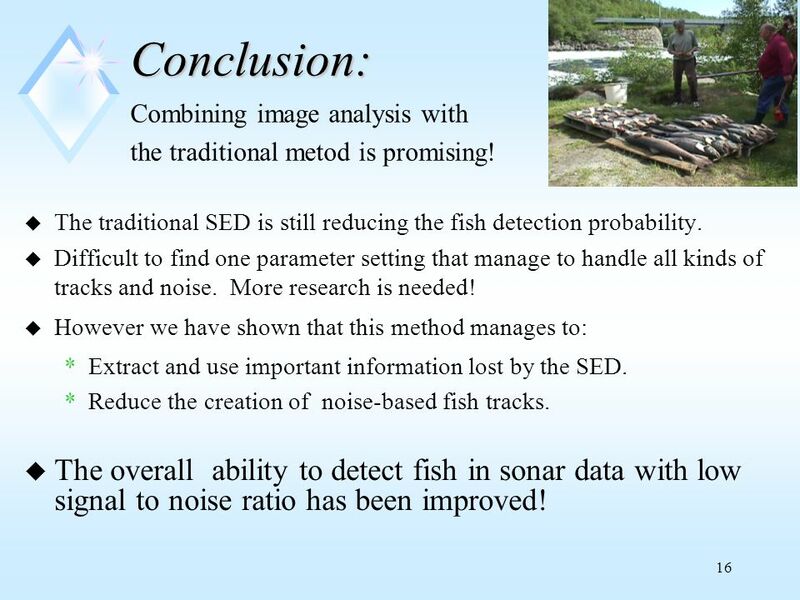 u The overall ability to detect fish in sonar data with low signal to noise ratio has been improved! 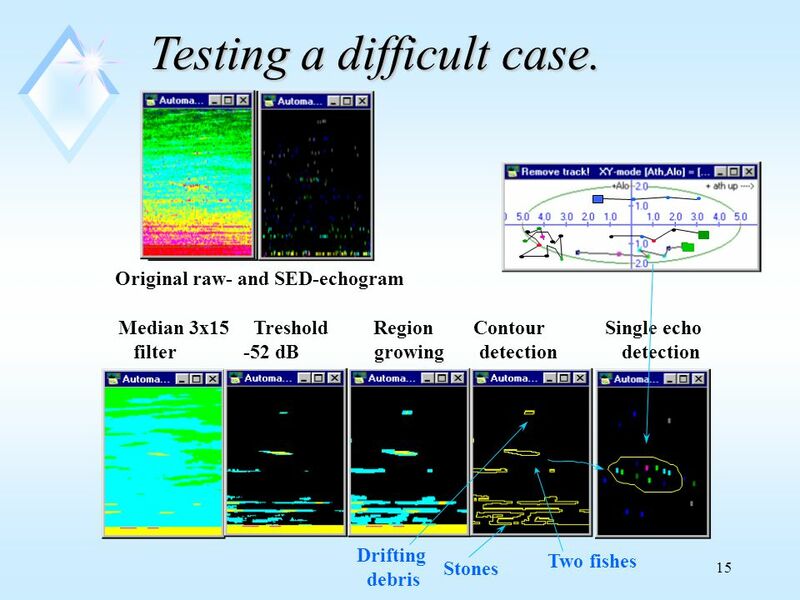 Download ppt "1 Improved fish detection probability in data from split- beam sonars. Helge Balk and Torfinn Lindem. Department of Physics. University of Oslo." Monitoring Fish Passage with an Automated Imaging System Steve R. Brink, Senior Fisheries Biologist Northwest Hydro Annual Meeting 2014, Seattle. Road-Sign Detection and Recognition Based on Support Vector Machines Saturnino, Sergio et al. Yunjia Man ECG 782 Dr. Brendan. 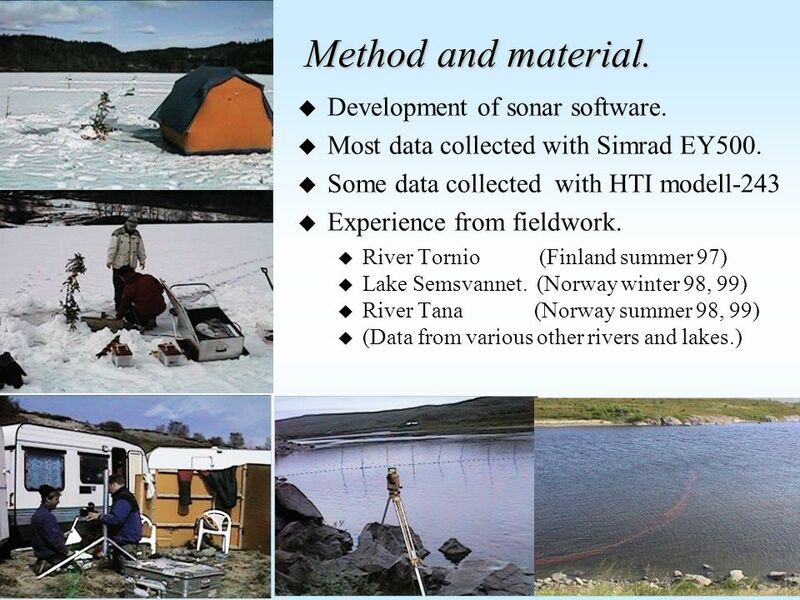 1 Monitoring fish migration in Rivers Helge Balk Department of Physics. University of Oslo. Sliding Window Filters and Edge Detection Longin Jan Latecki Computer Graphics and Image Processing CIS 601 – Fall 2004. 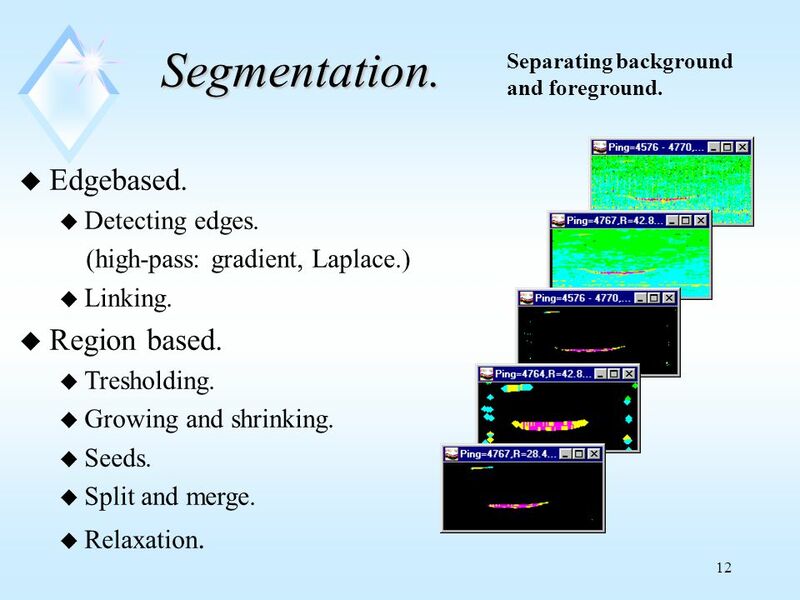 Segmentation and Region Detection Defining regions in an image. 1Ellen L. Walker Edges Humans easily understand “line drawings” as pictures. Machinen Vision and Dig. 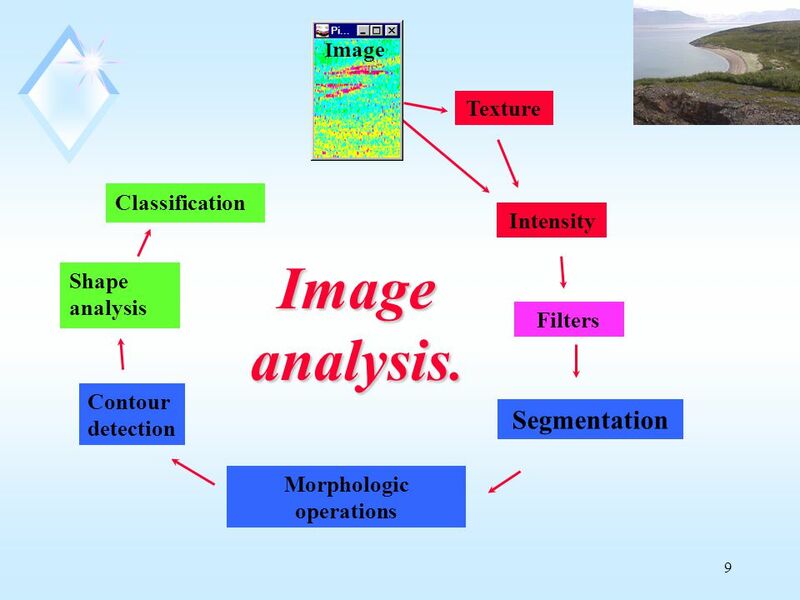 Image Analysis 1 Prof. Heikki Kälviäinen CT50A6100 Lectures 8&9: Image Segmentation Professor Heikki Kälviäinen Machine Vision. 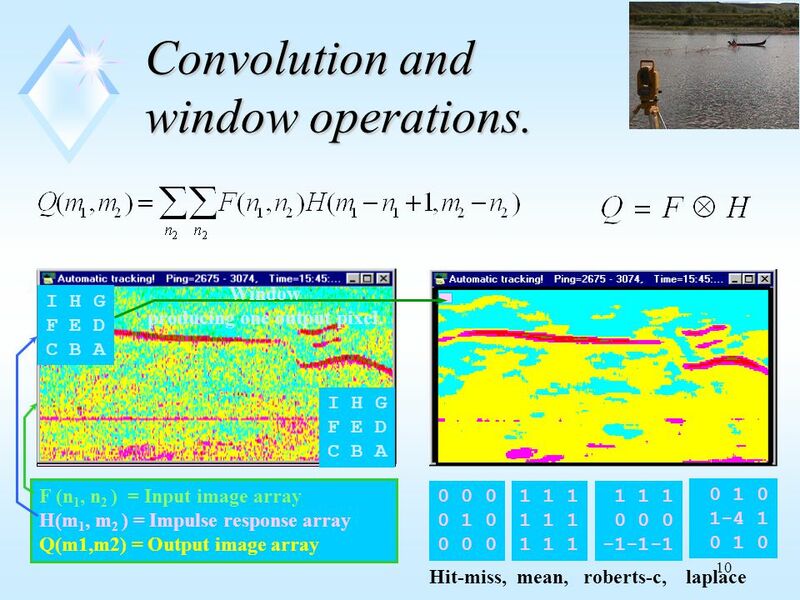 Text Detection in Video Min Cai Background  Video OCR: Text detection, extraction and recognition  Detection Target: Artificial text  Text. EE663 Image Processing Edge Detection 2 Dr. Samir H. Abdul-Jauwad Electrical Engineering Department King Fahd University of Petroleum & Minerals. Canny Edge Detector1 1)Smooth image with a Gaussian optimizes the trade-off between noise filtering and edge localization 2)Compute the Gradient magnitude.